Ulster Bank announced last year that it would close 14 of its branches in the Republic. A GROUP OF protesters will march on the streets of Ferbane in Offaly today as they fight to keep a bank in their village. Ulster Bank announced last year that it would close 14 of its branches in the Republic of Ireland, in response to what it calls “changing customer habits” – something that has angered the people of west Offaly. This march follows a public march in Ferbane on 19 December which saw over 1,000 people take to the streets. A statement from the Ferbane Bank Action Group says that the withdrawal of the bank would be a disaster for the town and surrounding towns. 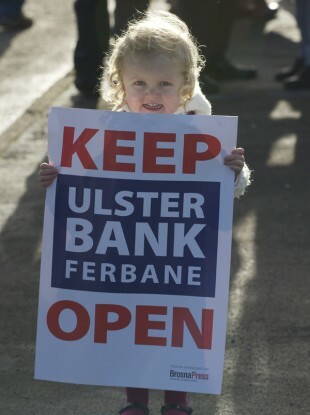 “Ulster Bank have had a presence in Ferbane for almost 100 years. The loss of the branch would be devastating for the town and for the wider West Offaly region. The impact on this closure is far greater than Ulster Bank have considered. “It affects local businesses, farmers, organisations, families, vulnerable people, the elderly. It is symptomatic of what is happening across the country in small communities who face withdrawal of services from banks, post offices, Garda station, fire stations. If these services disappears, the rural communities which they serve will disappear. Ulster Bank says that it is working with the local community and that the closure is in response to fewer and fewer customers carrying out their business in branch. Around 13% of all banking activity is done in-branch. “Banking has changed significantly over the last few years as more and more of our customers are using digital technology to bank with us where and when it is convenient for them. “Closing a branch is never an easy decision and one we do not take lightly. The decision to close any branch is made on a case-by-case basis, based on local information and we continue to invest in a range of channels to respond to how our customers prefer to do their banking. “We are writing to customers of these branches to inform them of alternative branch locations in their area and the range of banking services available on their mobiles, online and by telephone. We are also communicating directly with staff in those branches. Email “A community is taking to the streets today to stop its local bank from closing ”. Feedback on “A community is taking to the streets today to stop its local bank from closing ”.